We are uniquely positioned to support the global requirement for micro-cooling components, with over 50% of the worldwide micro-cooling systems emanating from Taiwan and China. As a global team, we are prepared to work with total cooling system providers to develop components state-side for pilot production and then move into full scale, high-volume production overseas.able of handling high volume productions for stamping. As typically required for IGBT base plates, we have the capability to put a specified bow to the base plates to counter the thermal distortion from the soldering of the semiconductor dies to the base plates. Extrusion – We have a library of extrusions to fit 90% of the power electronics which require liquid cooling today. We can also design and manufacture custom extrusions quickly and cost-effectively. Extrusion is not just for high volume anymore. Casting – We have become an expert in casting design with regards to liquid cooling and friction stir welding. Let us integrate our MDT pin plates into your cast invert enclosure. CNC Machining – Our CNC machining centers, coupled with the CAM programming, are utilized to produce various components for liquid cold plate products and to maintain close tolerances on complex parts. 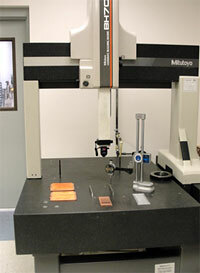 In addition, we build our own tools & fixtures with these machine centers. Plating – We can do electroless Nickel plating to ensure a uniform plating thickness to cover the entire surface of any intricate fin pattern, such as twisted MicroCool pins. An electrolytic Nickel plating is also available if needed. Other plating and surface treatments are available. Stamping – We can build a soft tool prototype for a short lead time, and a short run production for blanking and deep drawing. We are also capable of handling high volume productions for stamping. As typically required for IGBT base plates, we have the capability to put a specified bow to the base plates to counter the thermal distortion from the soldering of the semiconductor dies to the base plates. Brazing and Soldering – If FSW cannot be used, the joining of our aluminum cold plates can typically done in a vacuum brazing furnace or by torch brazing. The joining of our copper cold plates can be done by either batch furnace brazing or continuous furnace brazing. Heat Treating – We have the heat treating capability for any parts that need to be stress relieved, annealed or aged.